So here we are in Flamenco Land. Charlie on an acoustic steel string, descending figure, ascending figure, descend, ascend, and then what are those blues riffs doing in there? And it loosens up and drifts away into impossible improvisations, and how could any fingers ever put those chords together, and then here we are back at the zingaro campfire. It sounds like Buddy Deppenschmidt begins playing the drums with his hands, compounding the gypsy feeling, and then sparse insistent rapid taps and quiet clinks around the drumset. And Keter Betts’ bass isn’t walking those blues – it’s swinging and strutting and twirling and sashaying and pattering that soft shoe and leaping in big arches. The great D.C. jazz DJ, Felix Grant, used to sign off the radio with the words, “So Long Old Shoe.” This song is called “Scherzo for an Old Shoe,” a tribute to a great friend of Charlie’s, and every other jazz musician. It is the third and last movement of Charlie’s “Blues Sonata.” It closes with a return to a phrase from the slightly off kilter polonaise of the first movement, and ends with a very courtly A major chord. 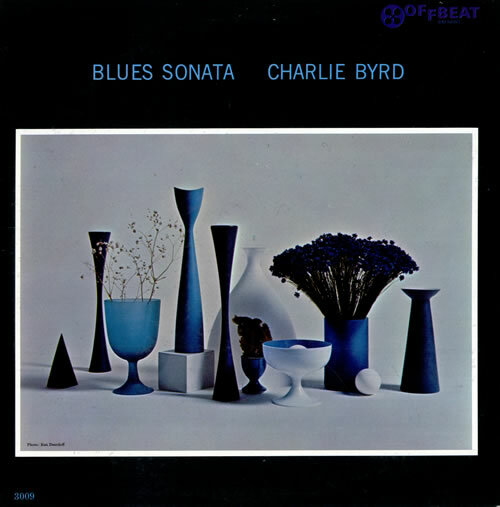 Charlie Byrd, Blues Sonata, Offbeat Reacords, OLP 3009 (1961). Album design – Ken Deardoff; Photography – Ken Deardoff, Steve Schapiro.